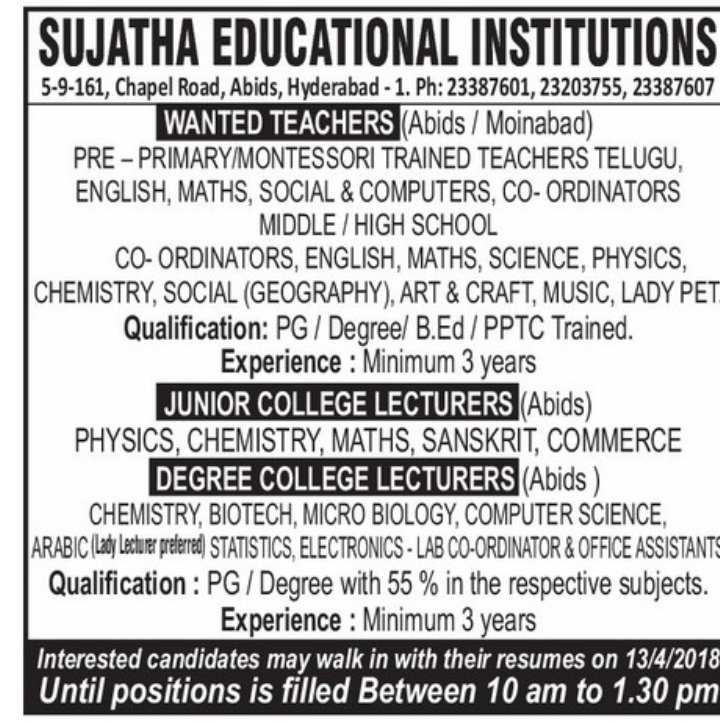 Sujatha Educational Institutions, Hyderabad has advertised in THE EENADU newspaper for recruitment of Teachers jobs vacancies. Interested and eligible job aspirants are requested to apply walk in 13th April 2018. Check out further more details below. 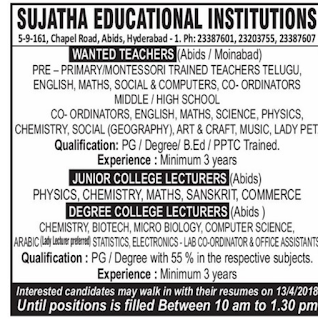 Name of the School: Sujatha Educational Institutions, Hyderabad. About School: Sujatha School is one of the associate institutions of Sujatha Group of Institutions (ie., Sujatha Arts and Science Academies , Abids, Hyderabad) with 47 years of experience in excellent School management skills. This group can be aptly termed as the outcome of long and relentless struggle of late. Mrs.Sita Jai Singh and Mr.P.B.Jai Singh, who had stepped into city about 50 years ago, upholding a vision and dream to fulfil. (b) Lecturers: PG/ Degree with 55% in the respective subjects. How to Apply: Interested candidates may walk in with their resumes on 13/04/2018, untill positions is filled between 10a.m to 1p.m.